Feeding groove, ventral the characteristic excavation of excavate taxa. The structure appears as a longitudinal groove extending at least 2/3rds the length of the cell. Its edges are defined by the microtubules and associated fibers originating from the left and right ventral microtubular roots. The fibers met posteroventrally and close the groove posteriorly. Bacteria are swept in to the posterior section of the groove by the beating of the posterior flagellum which lies within the groove. The bacteria are trapped in the posterior portion of the groove and ingested (how?). Image: O'Kelly et al. (1999). Filopodium a slender filamentous pseudopodium with a pointed end, branched or unbranched, consisting mostly of ectoplasm. A filopodium is usually supported by microfilaments and is dependent on actin. Mallavarapu & Mitchison (1999). From O'Kelly et al. (1999). Flagellum (pl. flagella): A eukaryotic flagellum is a bundle of nine fused pairs of microtubules called "doublets" surrounding two central single microtubules (the so-called 9+1 structure of paired microtubules; also called the "axoneme"). At the base of a eukaryotic flagellum is a microtubule organizing center about 500 nm long, called the basal body or kinetosome. The flagellum is encased within the cell's plasma membrane, so that the interior of the flagellum is accessible to the cell's cytoplasm. This is necessary because the flagellum's flexing is driven by the protein dynein bridging the microtubules all along its length and forcing them to slide relative to each other, and ATP must be transported to them for them to function. This extension of the cytoplasm is called the axosome. Important note: The eukaryotic flagellum is completely different from the prokaryote flagella in structure and in evolutionary origin. The only thing that the bacterial, archaeal, and eukaryotic flagella have in common is that they stick outside of the cell and wiggle to produce propulsion. Floridean starch chemically, the same as glycogen: poly (α1→4) D-glucose with (α1→6) side chains. However some sources indicate that, on a larger scale, floridean starch consists of aggregates of oligomers containing only 12-20 glucose units. Glycogen typically has a complex long distance structure with hundreds of covalently-linked glucose monomers. Gamogony: the process by which a gamont gives rise to many (1n) gametes. Gamont: a cell specialized for the production of gametes. Genetic code the standard code is shown in the table. Each sequence of three nucleotides in DNA or RNA potentially specifies an amino acid. In RNA, all T (thymidine) bases are replaced by U uracil). Other than this, the DNA and RNA codes are the same. During translation, ribosomes and associated enzymes "read" mRNA containing the code and assemble chains of amino acids (i.e. proteins) according to this blueprint. The code is redundant, in that each amino acid (except tryptophan and methionine) is specified by more than one series of codons nucleotide bases). The sequences UAA, UAG, and UGA signal the ribosome to terminate translation. There are minor variations in the code among eukaryotes. One of these is discussed in connection with the oxymonad Streblomastix. However, exceptions to the standard code are very rare. Glycocalyx a typically loose extracellular layer of polysaccharides. The term is used most frequently of prokaryotes. However, some eukaryotes have a similar coat, e.g., Microsporidia of the family Mrazekiidae. Morris & Adams (2002). Granellae crystals of barite (barium sulfate) accumulated by Xenophyophorea. Granellare the branching tubes which form the "body" of a xenophyophorean -- possibly homologous to reticulopodia. 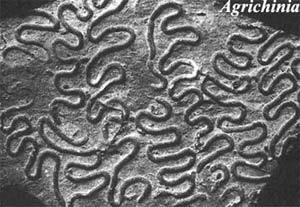 Graphoglyptid a type of trace or ichnofossil characterized by patterned, mainly meander-, star-, and net-shaped traces preserved almost exclusively in semi-relief on soles of turbidites or tempestites. Graphoglyptids are interpreted as burrows of unknown invertebrates, in which they farm microorganisms (category agrichnia). Image from the Hooper Virtual Natural History Museum. Heat-shock proteins a group of proteins involved in the folding of newly synthesized peptides. Hsp70 (a/k/a Cpn70): a class of "chaperone" proteins which assist in the folding of other newly synthesized proteins. Hsp70 proteins are ultimately of mitochondrial origin, although they have been incorporated into the nuclear genome in many cases. Hsp70 chaperones have a particular target preference for hydrophobic amino acid sequences. See also Welcome to Nurse Minerva. Intracapsular in radiolarians, the inner cytoplasmic region inside the capsule, a fibrous partition of the cytoplasm. The intracapsular cytoplasm is often referred to as the endoplasm. It usually contains the major cytoplasmic organelles, nuclei and Golgi apparatus. Karyomastigont the mastigont flagellum), the [9x2 + 1x2] microtubular axoneme underlain by its [9x3] kinetosome, all attached by a "nuclear connector" or "rhizoplast" to the nucleus. Margulis et al. (2000). Kinetid The combined basal bodies and cilia of a ciliary unit, including any ancillary fibers, microtubular roots, and cytoskeleton, comprise the kinetid. Each kinetid may have one or two basal bodies. The basal bodies may be ciliated or unciliated. If there are two basal bodies and one cilium, the unciliated basal body is always anterior to the ciliated one. A kinetid with just one basal body is called a monokinetid. A kinetid with two basal bodies is called a dikinetid. Kineties Rows of cilia on Ciliophora. A more interesting question is whether this word is singular or plural. If plural, what the hell is the singular? Almost all sources scrupulously avoid using the singular by various circumlocutions and studied grammatical artifice. One source uses "kinety," an Anglo-Saxon truncation that seems implausible on a Greek root. The truth is probably that the correct singular has been long forgotten or was never mentioned in the original paper, whatever that might have been. Wonderful are the ways of science. 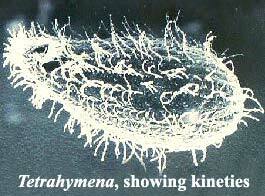 Kinetosome same as basal body. Kwagunt Fm Cryogenian Neoproterozoic) of northerrn Arizona (USA). Upper formation of the Chuar group exposed along the Grand Canyon. U/Pb zircon date near the top of the formation gives 742 ± 7 Ma. Testate amoebae. Porter & Knoll 2000).